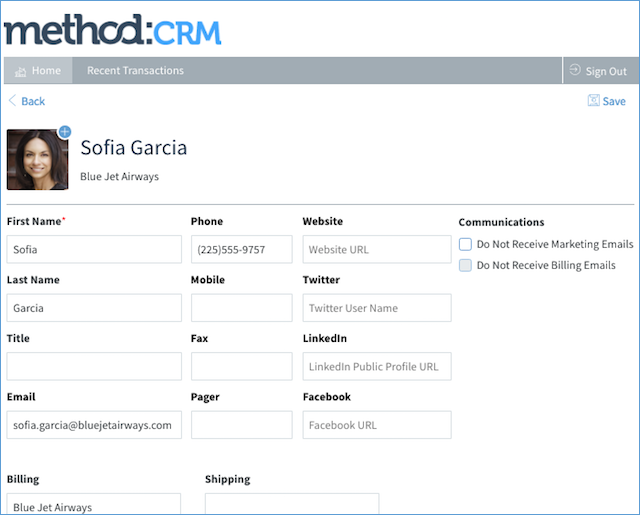 If you are a customer of a company who uses Method, they will direct you to your Contact Portal. NOTE: If you are a Method administrator, please check our article on giving customers access to their portal. When the you log in, you will be taken to the Home Page. 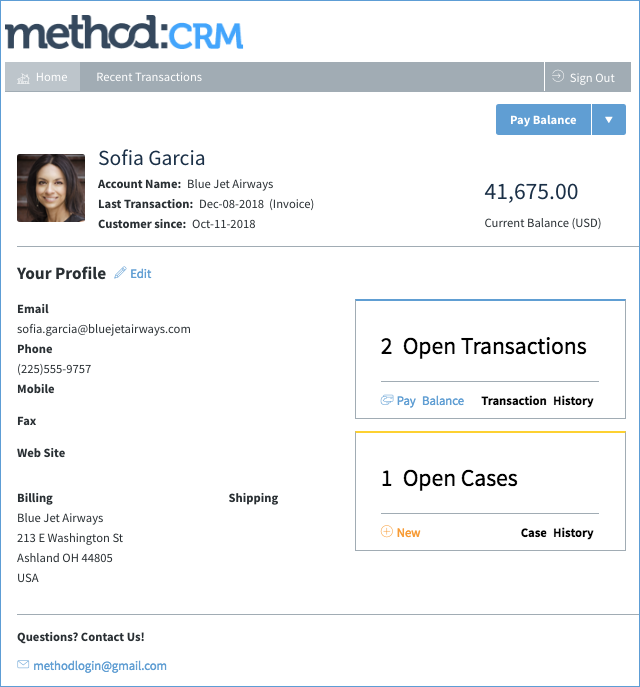 At the top is a menu which allows you to view your Recent Transactions and to sign out. 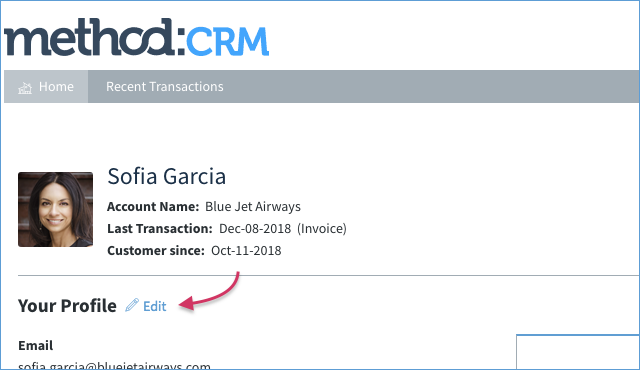 You can change your contact info by clicking on Edit beside Your Profile, or the Edit Profile Details button. This page will show all the transactions you have with the company. 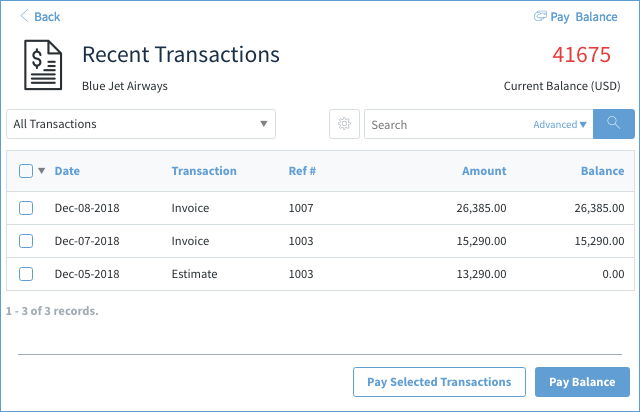 By default, any due and outstanding transactions will be listed in the grid, however, you can change the Filter View to show all your transactions. 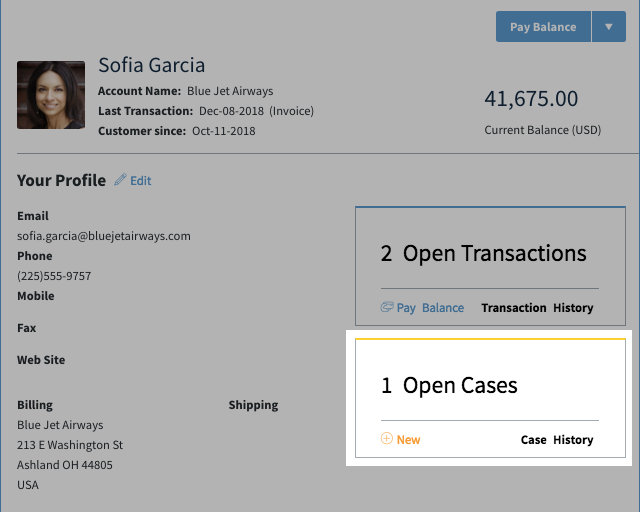 By selecting a transaction on the grid, you can view it in greater detail, and choose to print and/or pay it if a Payment Gateway has been set up by the company. NOTE: Not every company will set up a payment gateway. If the option to pay does not appear, then this option isn't available to you at this time. On the Home page, you may find Cases, or support requests, you have opened with the company. NOTE: Not every company will have Cases set up. If the option does not appear, then this option isn't available to you at this time. If you have any cases open or closed, you can view them all with the Case History link. The grid has three filters to choose from: Active Cases, Closed Cases, and All Cases. You can also use the search bar to find a particular case within the chosen filter. By selecting a case in the grid, you can see more detail about the case, as well as any interactions you have had with the the company. From there, you can choose to comment on the case, and even close the case if it has been resolved.